After months of planning and preparation, I am so thrilled to launch the PM for the Masses Podcast. The ribbon is officially cut! On this episode “zero” I introduce myself and tell you what this show is all about. I would love it if you would subscribe to the show in iTunes using this link. Project management has changed my life. I have been the project manager for our family business since 2005. For years I had the title of PM but didn’t really know what it meant. I was taking care of our business’ projects, making sure everything was being done according to the requirements, in a timely manner, within budget – you know the drill. I was basically doing my best to keep things moving forward. In 2009 we were living the bottom of a recession. On top of that, my father, who was also my boss, had a massive stroke. I started to think that I should be prepared to take action in case our company would have to close. It was scary times, and I quickly realized that the service we provided was so unique, that my skill set would be hard to transfer to another job if the company didn’t make it. So I decided that I had to make myself more marketable. Just in case. 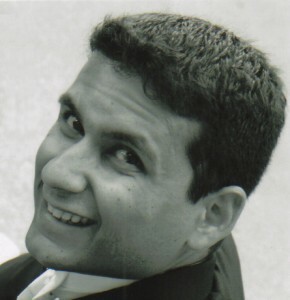 Cesar Abeid, PMP. Or “me,” for short. I started to look into the profession of project management for the first time. I knew somewhere out there there were courses, certifications, some sort of collection of best practices, but that was about it. It was only then that I learned about the Project Management Institute. I decided to start reading up on the PMBOK guide, or the Project Management Body of Knowledge, as well as some other companion books. I started to think, hey, I get this. So I decided to study for the PMP exam. Slowly but surely, my eyes started to open. I started to learn some basic things like the WBS (or work breakdown structure) and saw immediately that I could start using them in my work. I immediately started to see results at work. Finally I could rely on tested and proven ways to break down work, create schedules, collect requirements, communicate, etc, etc. My work started to get better. I started to be more reliable. I started to take more pride in what I did. Because of the results I was seeing and the boost of confidence I got, I also started to look at our own company differently. I had always seen what I did as a job. I was now starting to get the entrepreneurial bug, and started to be more interested in working ON our business, not just in it. And the best thing is that now I had a lot more knowledge in Project Management. I was getting really good at getting things done on time, on budget, and within scope. My personal life took a turn for the better as well. See, I had always been a relatively smart kid, but really never accomplished much. I could never finish things I started, and was known for being smart but unreliable and without much desire to accomplish great things in life. But once I learned how to break projects down into manageable chunks, plan the work, and work the plan, all of a sudden I started to move forward. I started studying the art of personal productivity and became REALLY passionate about setting goals for myself and completing them. That is why I say PM has changed my life. Our company made it. I got my PMP certification. My dad made pretty much a full recovery from his stroke. But best of all, I got clarity, a desire to keep moving forward, and a passion for PM and a passion for inspiring others to change their lives as well. This is the motivation behind this podcast. We already have what it takes. I truly believe that PMs are uniquely equipped individuals. In an increasingly complex yet superficial world in which we are forced to communicate in 140 characters at a time, PMs have the rare ability to go deep, to break complexity into comprehensive bits, to delegate, to see the big picture, to communicate effectively, and best of all, to see things to completion. Today, more than ever, this is a priceless skill set. 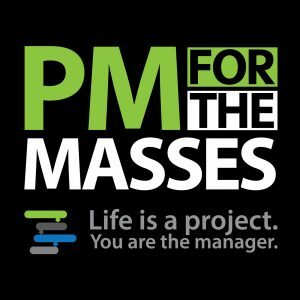 The PM for the Masses Podcast will inspire you, as a PM or aspiring PM, to make use of this skill set to move your life forward. You, more than any other professional, have what it takes to get that promotion, or to get a better job, or to open that consultancy business, or to write that book. Besides sharing my own journey, on the PM for the Masses podcast I will speak with other successful PMs – some names you may already know. I will ask them about their expertise and share it with you. But I will also ask them to share with us HOW they became the successful PM that they are. I will look at their success as a project, and will try to break it down so we can emulate and learn from their journey. Our lives, our careers, have a beginning and they have an end. They produce a unique result. Our lives are projects. We are the managers. I really want to inspire you to see this and take action to live life more intentionally, planning your work and working your plan. I want to inspire you to see that your career is truly in your hands, and as a PM you are uniquely equipped to make of it what you want. I also want to be my own guinea pig. As the host of the Construction Industry Podcast for the last couple of years, I realized that creating media and content is one of my strengths. With this podcast I am taking a bold step to rub shoulders with some of the most successful project managers in the world. I am totally stepping out of my comfort zone and using one of my strengths to stand out from the crowd. I want you to see what will happen to me and my career as I do this. I want to prove to you that when you find what your strength is, and use it in a smart way, wonderful things will start to happen. I have no idea what things will happen to me and my career as I embark on this journey, but I’m absolutely sure they will be wonderful. At the very least, I want this to be an inspiration to you. The PM for the Masses Podcast will be mostly an interview type of show. I am going to bring you some of the top names in PM today and truly pick their brains. We will learn from them and also learn how they made it. This Podcast series is a project – it will have a beginning and it will have an end. At this point I promise you 20 episodes. That is not to say I won’t produce any more than that. If I see that the podcast is really popular and I’m accomplish the goals I want to accomplish, I might continue further. We will see. I also need your input. Leave me a review in iTunes. Let me know what you’d like to see on the show. Keep me honest. I’m truly doing this to add value to our profession, and I want to make sure I’m hitting the spot. The only way to find out is to hear from you. I really hope you enjoy this show. To listen, subscribe in iTunes or press the play button on top of this post.